From the earliest days of his dictatorship, Saddam Hussein had vowed to destroy Israel. So when France sold Iraq a top-of-the-line nuclear reactor in 1975, the Israelis were justifiably concerned. The reactor formed the heart of a huge nuclear plant situated twelve miles from Baghdad, 1,100 kilometers from Tel Aviv. By 1981, the reactor was on the verge of becoming 'hot,' and Israeli Prime Minister Menachem Begin knew he would have to confront its deadly potential. He turned to Israeli Air Force commander General David Ivry to secretly plan a daring surgical strike on the reactor -- a never-before-contemplated mission that would prove to be one of the most remarkable military operations of all time. Written with the full and exclusive cooperation of Israeli Air Force high command, General Ivry (ret. 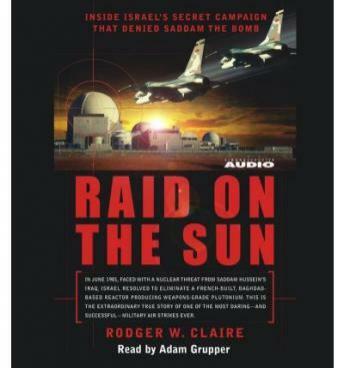 ), and all of the eight mission pilots, Raid on the Sun tells the extraordinary story of how Israel plotted the unthinkable: defying its U.S. and European allies to eliminate Iraq's nuclear threat. Claire recreates a gripping tale of personal sacrifice and survival, of young pilots who faced a nearly unsurmountable challenge: how to fly the 1,000-plus-kilometer mission to Baghdad and back on one tank of fuel. He recounts Israeli intelligence's incredible 'black ops' to sabotage constructions on the French reactor and eliminate Iraqi nuclear scientists, and he offers a pilot's eye-eye view of the action on June 7, 1981, when the planes roared off a runway on the Sinai Peninsula for the first successful destruction of a nuclear reactor in history. This book is a great summary of the events leading up to and how Israel attacked Iraq. This book is not only very factual but written in a form that almost anyone can find enjoyable. Funny thing is this book is about the Israeli air force but it got me really interested in the mossad. This book is not meant to be a military instruction manual on how this mission was performed (ground control interception guy), so if you're a fighter pilot don't read it or just try not to be so serious. I would and have recommended this book to everyone who reads non fiction. Great book to listen to. Like a Tom Clancey thriller only throughly researched non-fiction. Nice use of flashbacks to build the suspense. Also places the story nicely in historical context. I was impressed, great story and read well. Action packed. A good history lesson. This reminded me of "star wars" when I was a child--the bombing of the Death star. A must read for History buffs and anyone interested in aviation or the middle east. Absolutely amazing story of an event that I did not even know took place. For anyone who was too young to remember the early 80's, this book really sheds light to the political and socioeconomic environment in the Middle East during that time. The author does an excellent job describing the lives of the pilots and their families, the planning that went into such a complex mission, and the result of it's success. This is a great book for anyone interested in aviation, strategic planning, or military actions in the Middle East. Very good historical account of an event we criticized Israel for at the time, but have been greatful for ever since. As far as the overall story goes, it was well-told and, I believe, accurate. Good summary of events with sufficient background (if you're not up on your history in the Middle East in general, or with regard to Iraq and Israel specifically). I could have done without some of the writing style (things like, "the guard stood motionless on the dark street corner, his Kalashnikov bulging underneath his knee-length leather trench coat.") A bit too Harlequin Romance for me at times. The description of the fighter brief/debrief and flight events was good, but the narrator could have used some coaching from someone fluent in pronunciation of military jargon. I found this audio book very entertaining. I really knew nothing of the raid so I was eager to listen to the book. The author did a great job introducing the people who were involved in the raid and giving applicable background on the events that had an impact on the raid. The description of the raid itself was detailed and exciting. I recommend this title.